Just when we thought the holiday season couldn’t get any better, Elaine’s birthday miraculously fell on Christmas Eve, December 24th! So on top of all the other celebrations Southgate Coins has taken part in over the last few weeks, we also got to celebrate Elaine’s birthday, and focus all our attention on her for the day (trying not to think too much about the fact that it was finally Christmas Eve)! 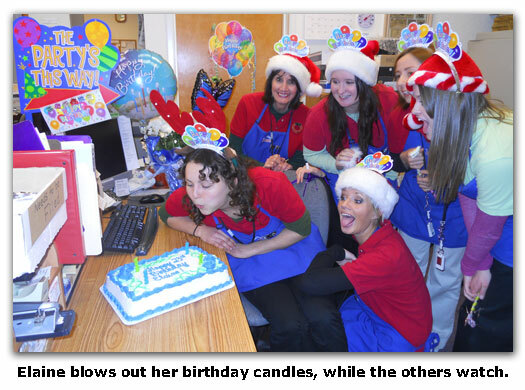 Read on to hear more about Elaine’s 23rd birthday! I (Nicole) have never worked with someone, or even had a friend or family member whose birthday was this close to Christmas, so it was exciting to be able to celebrate Elaine’s with her. The only thing that makes birthdays difficult at this time of year—which I never realized—is the fact that everything is so dominated by Christmas-themed decorations, colors, and gifts. It requires a little more effort to find something special for someone when the event isn’t so holiday-influenced. I realized this when I went out searching for flowers for Elaine. Through observation of what Elaine wore outside of work, we noticed that she predominately wore the color blue. Therefore, we thought that would be the perfect color for her decorations and flowers. After going to three stores and not finding anything besides bright red poinsettias or some kind of red, green, and gold flower arrangement, it seemed hopeless to find anything blue. I was finally able to find some fresh white mums, and with the help of a very sweet sales associate, who understood my frustrations, she re-potted the plant for me and redecorated it with blue cellophane and a big blue and silver bow. We also found an adorable blue butterfly balloon to stick in with the flowers. No matter what, all the efforts put forth are always worth it, because when Elaine came into work this morning, she was absolutely delighted to see all the decorations along with her special arrangement of blue-decorated white mums, finished off with a Happy Birthday balloon. I (Akimi) am so happy Elaine enjoyed our special birthday decorations. For my part, I took decorating to the next level and used a ladder to literally hang a HAPPY BIRTHDAY banner on the wall near the ceiling. I was scared, but it was all worth it. Rusty, Maya, and Nicole made sure that every space was filled with fun decorations. 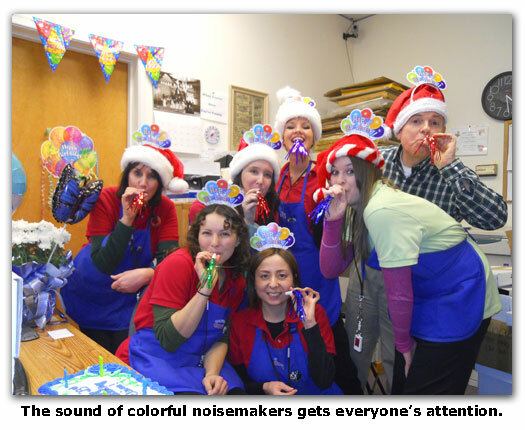 The store was filled with celebration spirit once again! Now, the gifts! Since Elaine is born on Christmas Eve, we wanted to make sure this party was separate from Christmas, and that it was memorable day for her. It was so much fun to shop for Ms. Elaine, since she is so cultured. It gave us many options to choose from. The first word it came to our minds was “ethnic.” We wanted to be as creative as we could. Elaine received an ethnic-themed gifts consisting of purple-and-gold-colored ethnic purse with gold elephant print, a specially designed champagne glass, gold-colored earrings. She also received a tea set with a teapot, a painted mug, and different types of tea to enjoy. For the very last gift, we got her a gift card to the Playful Potter, where she can design her own pottery in creative ways. We thought this would be a perfect gift for her artistic genius! Judging from her smile and reactions, we are confident we nailed it! Thanks, Akimi. Well, I (Maya) have to admit I’ve become well-versed in cake-ordering lingo. However, it usually works best to just draw a picture of what I’d like for the cake, and hope that the cake decorator can decorate-by-numbers! This time they did wonderfully, though. Elaine was delighted when she saw it. Everyone enjoyed the cake, and some of us decided to top it off with delicious vanilla ice cream. I even brought a half-gallon milk so that everyone had something to drink. Since Elaine is our only Christmas Eve-baby, we were glad that she was able to celebrate her birthday with a group outside of her family. She’s one of the lucky ones, though—she celebrated Christmas early with Southgate Coins last week, then we had her birthday party this week. She even conspired to have her birthday land on a Free Lunch Friday, to boot! Now, she gets to spend the weekend enjoying Christmas with her family. We’re always happy to make someone’s birthday special, and we’re glad that Elaine got to be the center of attention this Christmas Eve. We hope you enjoy your presents, Elaine, and that you have a great rest-of-your-birthday, and a wonderfully Merry Christmas!